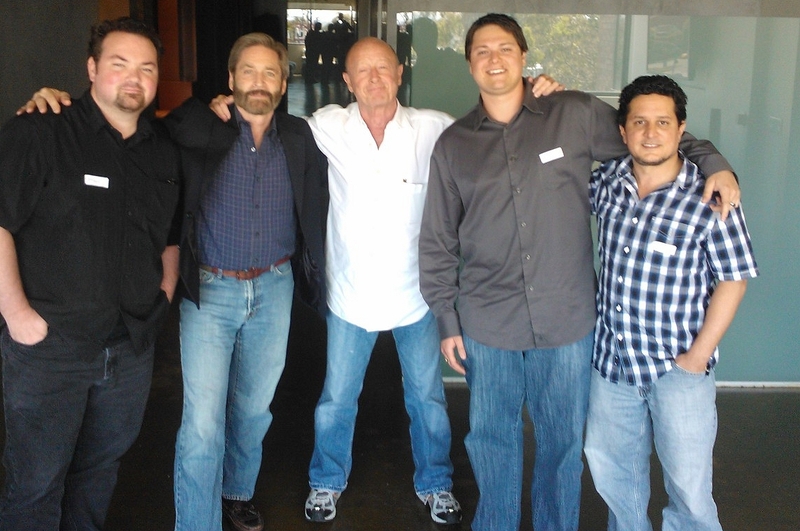 On August 9th, my creative crew and I met Tony Scott at Company 3, a well-known postproduction studio in Santa Monica. We were there to watch Tony do a final luminance check on Top Gun 3D and to memorialize our wrap of the movie by meeting him for the first time and to take some photos. After the session Tony hung out with us, joked with us, signed posters and posed for several photographs. I was fascinated by how very human an A-list director could be. Our thoughts and prayers go out to Tony’s family. We can only imagine the shock and emotions they are going through right now. Indeed, they’re not alone. Everyone in the entertainment industry and the millions of people he touched through his craft feel the loss. There will never be another Tony Scott. Founder - Graffiti Video, Inc. This is a series of blogs by Barry Sandrew, Ph.D., an internationally recognized inventor, digital imaging expert and visual effects pioneer. Dr. Sandrew is founder of three visual effects facilities that were among the largest and most prolific production studios in Hollywood. Over the past three decades he has been and continues to be instrumental in evolving the entertainment Industry's digital standards and processes in feature filmmaking. Sandrew earned his doctorate in neuroscience from SUNY at Stony Brook. After winning a 2 year NIH Fellowship at Columbia University, College of Physicians & Surgeons, he joined Harvard Medical School/MGH as staff Neuroscientist. In 1987, Sandrew left his academic and scientific career to found American Film Technologies (AFT) where he invented the first all digital process for colorizing black and white feature films. At AFT he also invented a paperless animation process used to produce episodic animation for Fox Children's TV and a digital ink & paint and compositing pipeline that produced Spielberg's first digital animated feature film, "We're Back: A Dinosaur Story." Sandrew took AFT public while converting hundreds of movies for clients such as Turner, Disney, Warner Bros., Fox, Gaumont, TF1, ABC, and CBS, among many others. In 1993 Barry Sandrew left American Film Technologies to co-found Lightspan, an animation and production edutainment studio that grew into one of the largest educational software companies in the U.S., marketing into entire school districts around the country. Lightspan ultimately went public and was later acquired by Plato Learning. In 2000, Sandrew founded Legend Films, re-inventing colorization and a proprietary film restoration process using the latest in digital imaging technology. Over the course of the next 7 years, Legend Films converted to color approximately 145 black & white films as well as several TV series. Legend Films also produced visual effects for Scorsese's "The Aviator", HBO's "Entourage" and other high profile TV and film projects. In 2007, with Jim Cameron's game changing "Avatar 3D" scheduled for a 2009 release, Sandrew leveraged his proprietary colorization pipeline, redirecting his company's entire R&D focus to embrace 2D-to-3D conversion and changing the company's name to Legend3D. Since 2010, Legend3D has lead the competitive field, producing 3D conversion and visual effects on over 35 of the highest performing box office tentpole films of the past 6 years. In 2014, Dr. Barry Sandrew left Legend3D to focus on new immersive and web based media technologies as well his non-profit and for-profit board positions. He is consultant to Fortune 500 companies re: mobile 3D-sensing and motion tracking technology that he considers precursors to augmented reality. Most recently, he is Co-Founder and President/CEO of Graffiti Video, Inc. a company that is redefining the curation of web based media. Jared Sandrew, Stereoscopic Supervisor on "The Walk" Discusses His 3D Conversion Of The Sony Blockbuster! Copyright - Barry Sandrew, Ph.D., 2015. Powered by Blogger.